I didn’t get much sleep on the flight back to Israel yesterday, since I was being blown away by the book Proof of Heaven: A Neurosurgeon’s Journey to Heaven. This PHENOMENAL book, which describes the near-death experience of a former skeptic and faculty member at Harvard Medical School, has spent 35 weeks on the New York Times Bestseller List. In other words, JewishMOM, JUDAISM IS TRUE! G-d wants us to be good. 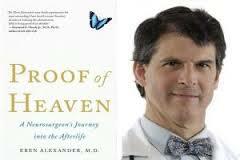 Dr. Eben Alexander says that when he woke up in the afterlife, there were no pearly gates or angels. Instead, he says, he had no memory of his life on earth and found himself in a dark place until a beautiful presence took him into another dimension. Watch as he describes his first memories of his near-death experience. After emerging from the dark place he first found himself in during his near-death experience, Dr. Eben Alexander says, a beautiful woman guided him into another dimension on the wing of a butterfly. Watch as he recalls the experience and shares the message this woman gave him that we can all take to heart. Dr. Eben Alexander was a skeptic until his near-death experience made him a man of faith. After writing his book Proof of Heaven, he has received skepticism from others. Watch to see his message to them and to hear why he doesn’t believe his experience was caused by drugs given to him while he was in a coma. There was recently an article in Ami magazine about others who have had these experiences. Thanks for sharing this! it is sad that just the other day i found two articles on regular news sites that gave “proof” that Dr Alexander’s experiences were fabricated, explained by certain brain-states of coma (or some other techno-gobbledy-gook word). the secular society and its anti-religious media are working hard to disprove this and any other account of the existence of G-d.
we know how frustrating it feels to create something and have someone else steal the credit. we can hardly imagine what G-d feels when the whole world He created simply denies His existence and role in its creation…. There must always be free choice to believe, so when these things happen there must be an equally opposite and believable reaction. Hashems messenger was a neurologist, no less! So the resistance must be fierce. Is the book available in Israel yet? about 52-3 years ago i was pronounced dead..heard the dr. tell my mom, heard him tell the nurse time of death,saw him, nurse, mom everything,he removed all the tubes etc. long story. at that time no one talked/published these FACTS, they were too bizarre and only the people involved bore witness..the poor dr. nearly had a heart attack when suddenly as he pulled the sheet over my face i gasped like coming up from the bottom of a pool. i heard and saw everything..the white light that’s now so familiar to people….the utter peace and serenity, the cessation of pain, the grief on mom’s face..the G-d “sence” to this day is as real as then,that i was given another chance…and I KNOW ! !